TimeMapper is an advanced chronological tool with an interactive timeline whose items connect to a geomap. Creating a timemap with TimeMapper is as easy as filling in a spreadsheet template and copying its URL. However, the benefit and the information we get from TimeMapper are much more than expected. In the TimeMapper, we put events on a straight line in time order, which can better show more specific time sequence and time distance between each other. At the same time, by plotting geography, Chronologies became precise and testable in a new sense and passion for exactitude to represent time in novel ways. TimeMapper also shows us the different events that happened in the same period with different locations around world. Therefore, it provides us a chance to think about the story and the relationship behind each event. According to the time of Payne and Froehlich’s travel journal, we created a timemap with the events happened around 1740s. Here, we mainly focus on the events in the United States that may be related to the journal. 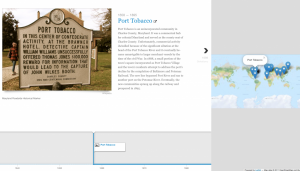 As you can see in the TimeMapper (link: http://timemapper.okfnlabs.org/anon/7bvfj6-), there were lots of events happening during that time periods such as the smallpox broke out in Pennsylvania, the events in Port Tobacco, and the occur of colonial ferries. We discovered the slave trade in 1740s, which may relate to the journal as well. If we read the journal alone, we cannot explore these events and relate them together. However, it’s really hard to make a specific location spot on the map. For example, Great Wagon Road is a very long road from Philadelphia to South Georgia. In this case, we choose the location where Payne mentioned “Great Road” in his Journal since the location it’s difficult to be identified. Overall, creating timemap for the travel journal and the historical context of the journal does help us understand Payne and Froehlich’s journey better. The travel journey now can be interpreted more clearly by the spacial representation of time.